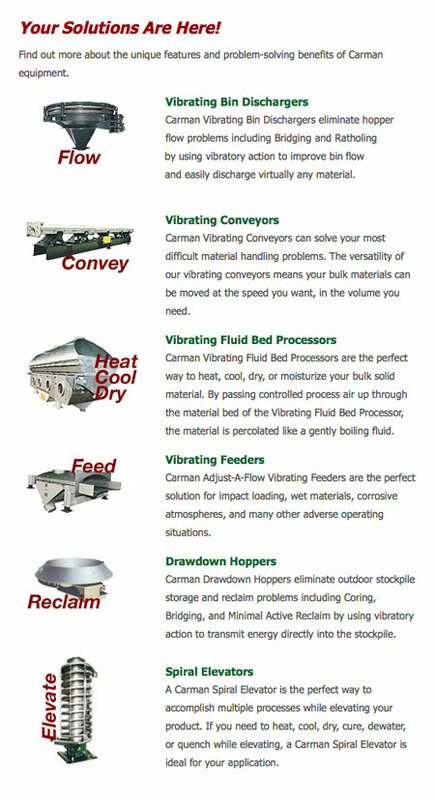 Home » Manufacturer » Carman Industries Inc. Founded in 1961, Carman Industries manufactures the most complete line of vibratory material handling and processing equipment in the industry. Our problem solving expertise has earned us the confidence of dozens of Fortune 500 companies who rely on our solutions to process their products day in and day out. ...and many others. Check out our website for some industry specific examples of our work. Talk to us about your application. We'll share decades of innovations and hands-on expertise to develop the ideal solutions for your processing needs, solutions that are "Built To Deliver".